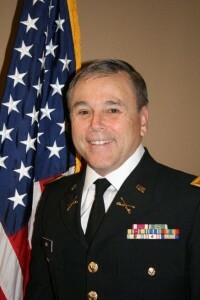 Colonel John R. Ady, United States Army, retired, was born in Chicago, IL and raised in the Chicago suburbs. He is married to Sharon, and has 5 children and 11 grandchildren. Colonel Ady has a B.S. in Business Administration from Illinois Wesleyan University, an M.B.A. from the University of Illinois, and a M.S. from Eastern Illinois University in Guidance and Counseling. His military education includes armor officer basic and advanced courses as well as the U.S. Army Command and General Staff College. Colonel Ady’s Army career spanned 32 ½ years including service on active duty, active reserve, and the Army National Guard in both Illinois and Massachusetts. During this time he held numerous command and key staff positions including the commander of the 66th Brigade FSB and the commandant of the IL Military Academy. His military awards include the Legion of Merit, the Meritorious Service Medal, the Army Commendation Medal w/2 oak leaf clusters, and the Army Achievement Medal w/2 oak leaf clusters. John’s civilian career included marketing and human resources assignments with a Fortune 500 company for over 20 years. He established and operated Ady & Associates, a human resources consulting company for 18 years before retiring in 2005. John has always had a keen interest in music and at one time he was both a classical clarinet player and played tenor saxophone while in college in both a jazz band and a blues band. His current musical interest includes playing the Native American Flute which he finds to be a relaxing past time. A perfect marriage with our diverse cultures here in Arizona. It addition, he is a frequent visitor of the Musical Instrument Museum in North Phoenix. John’s volunteer service to the community includes serving as the Kiwanis Sunrise President in Danville, IL; the President of the Champaign, IL Rotary Club between 2004-05 with over 200 members, was selected as a Rotary Paul Harris Fellow, and during his tenure as president, the Club was selected as the district large chapter of the year; served as President for 2 years for the Champaign, IL MOAA Chapter; and has been a member of The Arizona Chapter MOAA since 2007 and has served as the Membership Chair, the 2nd Vice President, and as our 51st Chapter President, serving in 2011 and 2012.